Has Canon revealed its mirrorless technology? Will the 650D sensor appear in a mirrorless camera? Is Canon testing the water with some of the 650D's technologies ahead of a mirrorless camera model? For a start, the EOS 650D is Canon's first DSLR to feature full-time autofocusing in Live View and video mode. Both of these modes require the reflex mirror to be lifted out of the way, so the camera in effect emulates a mirrorless model. Full-time focusing is enabled by the new Hybrid AF system that combines the benefits of phase detection and contrast detection, using information drawn from the imaging sensor. It also enables the Live View AF to be much faster than normal. We have seen hybrid AF systems before in mirrorless compact and compact system cameras such as the Nikon J1 and Nikon V1. Like Canon's other DSLRs, the Canon EOS 650D has a separate dedicated autofocus sensor that works when the reflex mirror is down and reflecting light towards it. However, when the mirror is lifted for Live View or movie recording, the camera uses dedicated pixels on the imaging sensor to facilitate hybrid autofocusing. According to Canon UK's David Parry, in Live View and video mode the Canon EOS 650D uses the phase detection part of its hybrid AF system to get the subject close to being sharp, and then the contrast detection part to get the focus spot-on. Phase detection AF systems are generally faster than contrast detection systems, not least because the camera knows which way to adjust the lens to achieve focus. Contrast detection systems adjust the lens to find the point of highest contrast but they don't know which way to move the lens, and as a result, although more accurate than phase detection systems, they are usually slower. Combining phase and contrast detection should enable faster, more accurate autofocusing than using either method alone. Both of these points would benefit a mirrorless camera. One of the major benefits of a mirrorless camera design is that they can be made smaller than the average DSLR. However, this can make finding room for large control buttons and dials tricky. One solution is to use a touchscreen that enables camera settings to be adjusted via the screen. The Canon 650D is the first DSLR to have a touchscreen, and our experience with a pre-production sample indicates that it has been implemented extremely well. 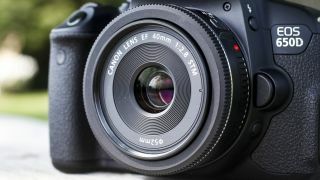 Although the Canon EOS 650D's screen is accompanied by the usual array of DSLR direct controls, just about every feature can be controlled by touching the screen. It's even possible to use pinch-to-zoom control when examining images. Could Canon be testing the water before it launches a mirrorless camera with touchscreen control later in the year? Rumours that Canon is developing a mirrorless camera have been rife for ages now. With Nikon joining the market last September with the V1 and J1, it is the only major camera manufacturer without a compact system camera line. Many believe that 2012 will be the year that Canon steps up to the mirrorless challenge, with Photokina - which takes place in September - seeming to be the likely announcement forum. Keep checking back for more details as and when they arrive.